A Hyundai marketing slide has leaked onto the internet, showing a planned refresh of the Ioniq EV coming in September 2019 with a new 38.3 kWh battery pack and the range increased by 35%, giving it a likely EPA range rating of around 167 miles (270 km). Will this modest refresh keep the Ioniq competitive? The marketing slide was shared on the GoingElectric.de forums, by user Andi3110, and it appears authentic. Of course, Hyundai has not publicly committed to the plan (neither the timing nor the specs), but the details seem to be in-line with reasonable expectations from Hyundai watchers, and the battery size matches that of the base Kona EV (as well as siblings, the Kia Niro and Kia Soul). The slide also details related refreshes of the hybrid and PHEV versions of the Ioniq, which are scheduled for July. The only official word from Hyundai so far, on timing, is that the P/HEV versions will be released to Europe in H2 2019, so that information confirms the slide in that aspect. We don’t yet have details of the charging speed of the new Ioniq EV, but we can expect it to be at least as fast as the old Ioniq (measured at up to 69 kW by Fastned). 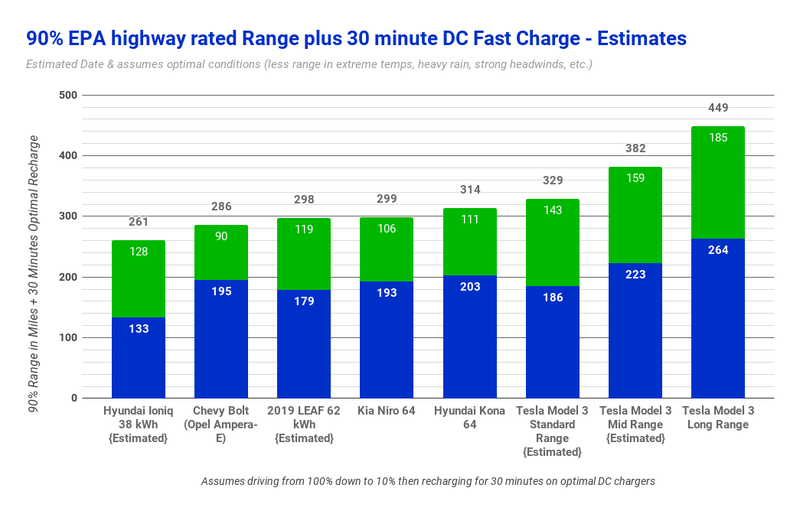 Given Hyundai’s history of leadership with the charging speeds of affordable EVs, the charging speed could conceivably be boosted higher, but most likely not much beyond the 72 kW of the Kona and Niro. The battery is almost 37% larger than the current Ioniq, so in principle the EPA range could be rated at 170 miles (274 km), if there is not much additional weight penalty. We can see from the slide that the electric motor (and presumably the rest of the powertrain) is carried over from the existing Ioniq without change (“keine Änderung”). However, the comparative NEDC range ratings for the old and new versions scale to a 35% increase, so 167 miles for the EPA combined range rating (from the existing 124 miles / 200 km) is the conservative estimate, until we know more. As usual, NEDC ratings (378 km / 235 miles) are greatly overinflated, and EPA ratings are a much better guide to practical range. The rest of the Ioniq is essentially just tweaked — for example, it has a slightly more modern infotainment interface — but the car is otherwise much the same both inside and out. Note that the “EPA highway” figures may not exactly reflect highway driving, but are usually a good approximation of somewhere between 70 and 75 mph (110–120 km/h) in favorable conditions, and have the benefit of providing a level playing field for comparison. It’s clear that the Ioniq’s range is lacking, but that — with its great energy efficiency — its miles-per-minute charging speed is still relatively fast (even assuming the kW power level doesn’t improve over the previous generation). This means that you may be able to stop for 20–25 minute breaks and still add considerable range. The Teslas’ charging speeds shown in the graph are faster still, and yet these figures are actually conservative. As I recently noted, it’s likely that the Model 3’s batteries (in all variants, including the Standard Range) have already been designed to make good use of the higher charging speeds arriving in Supercharger v3 in the coming months. Even as of now, any of the Tesla Model 3s perform significantly better as road-trip vehicles than their rivals. The Long Range version is of course way out of the price bracket of the Ioniq, and is included in the chart for comparative reference only. Bear in mind that the rollout of optimal (100+ kW) charging infrastructure is still in progress for CHAdeMO (the LEAF) and CCS (the Bolt/Ampera-e, the Hyundais, and the Kias), and it is better in some regions than others. Most existing DC chargers only allow these CHAdeMO/CCS EVs to charge at around two-thirds of their potential power. This will improve over the next year or two. In all of Tesla’s markets, good Supercharging infrastructure for long journeys is already in place, and is still improving all the time. Those infrastructure caveats in place, for many owners and families who take frequent rest stops anyway, and who only do medium-distance road trips (250–300 miles / 420–500 km) a few times a year, all of these vehicles will be up to the task and offer a great ownership experience, much better than a gas vehicle. For young families who need the form factor, the CUV vehicles (Hyundai Kona, Kia Niro, and Kia Soul) have a great balance of range and charging capability. Note that the 64 kWh Kia Soul’s range and charging figures should essentially be a clone of the 64 kWh Kia Niro’s (visible in the chart). The Bolt/Ampera-e is still strong for certain use cases, but its slower charging is starting to show its age for longer trips. On the basis of these figures, it seems like the “new” 38 kWh Ioniq should really be thought of as a version 1.5 upgrade, more of a refresh than anything else. 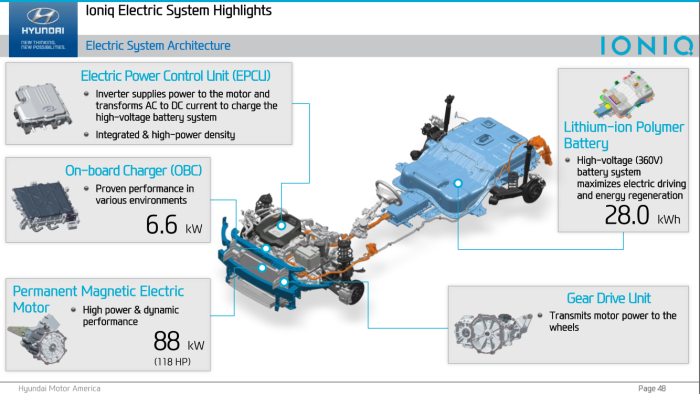 It’s worth remembering that the Ioniq’s underlying platform was primarily designed for hybrids and does not have a full skateboard layout for the battery (unlike every other model here). 38 kWh is probably the physical limit using available cell chemistry. The next full version of the Ioniq will presumably remedy this, and be more similar in platform layout to the Kona/Niro design (full skateboard). Ioniq platform layout (design unchanged since 2016) – not a full skateboard. Whether the Ioniq will compete with the 62 kWh LEAF will depend heavily on pricing in their key markets (as well as on respective availability). We don’t have clear details on this yet, except that the new LEAF will be more expensive than the existing 40 kWh version. If the Ioniq’s price is unchanged over the existing model, and the availability is there, I can see it competing well with the LEAF for some buyers. Particularly if the LEAF turns out to repeat the battery heating and charge throttling characteristics of its forebears (time will tell). With its very fast charging, and Hyundai’s excellent reliability, I can especially see the new Ioniq competing strongly in the taxi market in some regions. However, for regular consumers shopping for the sedan body shape, both LEAF and Ioniq will have a hard time competing with the Model 3 standard range. The entry Tesla will certainly be priced close enough to the 62 kWh LEAF in many markets to be cross-shopped. The Ioniq will likely be a good bit less expensive, but will be a lot less capable car than the Tesla, and arguably perhaps even less good value for those who might be able to make the stretch. The Tesla will also likely retain its value a lot better, especially with over-the-air upgrades, the potential for full self-driving tech, and the coming Supercharger v3 capabilities. What do you think? Please share your thoughts in the comments.